What do you know of Dasam Granth? Dasven Patshaah Da Granth (ਦਸਵੇ ਪਾਤਸ਼ਾਹ ਦਾ ਗ੍ਰੰਥ: “Book of the Tenth Emperor”) or Dasam Granth (ਦਸਮ ਗ੍ਰੰਥ), a scripture of the Sikh religion, which is a collection of different books that has been bounded into a single volume. It contains texts composed by the Tenth Guru, Gobind Singh Ji. The Granth (volume) itself was not in existence when Guru Gobind Singh Ji left his mortal body and gave the Gurgaddi to Sri Guru Granth Sahib Ji and is believed to be compiled later by Bhai Mani Singh between 1730 – 1732 CE. Dasam Granth is not like Sri Guru Granth Sahib Ji and does not have the status of being Guru or treated as such. However, as it contains Amrit-Bani (divine prayers) that form part of Sikh faith’s Nitnem (daily prayers), Ardaas (supplication) and Sikh Rehit Maryada (Code of Conduct) it is regarded with great respect. The Jaap Sahib, Tve Prasaad Svaiyye and Benti Chaupai, the source of Banis of Nitnem and Amrit Sanchaar, are all compositions from Sri Dasam Granth. The beginning portion of the daily Ardaas (supplication) for Sikhs is also a composition within Sri Dasam Granth. Furthermore, the writings and compositions of the Tenth Guru are also the source of the terminologies and phrases of the Khalsa. Some prominent examples being ‘Waheguru Ji Ki Fateh’, ‘Deg Teg Fateh’, ‘Bipran Ki Reet’, ‘Panth’, ‘Khalsa’, ‘Khanda’, ‘Kirpan’, ‘Sarab-loh’ etc. According to the Panthic Sikh Rehat Maryada, one of the primary conditions for a person to qualify as a Sikh is that he “should faithfully believe in Sri Guru Granth Sahib Ji, the utterances and teachings by all ten Gurus and the baptism bequeathed by the tenth Guru”. It is a fact that the Tenth Guru composed Bani (ਬਾਣੀ) a source of our daily prayers, and also produced literary works (ਰਚਨਾਵਾਂ) that translated Hindu mythology in which the Guru showed that the so-called gods and goddesses of India are nothing more than mere humans and not divine as believed. However, since the time the writings or pothis, to be later compiled and bound into one single volume and called “Dasam Granth” (the granth (scripture) of the Tenth Master), were originally found, there has been a controversy about their authorship, authenticity and historicity. Very few persons have made a serious study about their genuineness. It is undeniable that Sri Guru Granth Sahib Ji is our Living Guru, and its principles and doctrines are our Sole Guide to test the veracity or acceptability of any idea, concept, writing, suggestion or activity. Gurmatta passed 6th June 2008 at Sri Akal Takht Sahib. Sri Dasam Granth was not in existence when Guru Gobind Singh Ji left his mortal body and gave the Gurgaddi to Sri Guru Granth Sahib Ji. Sri Dasam Granth is believed to have been compiled after the Guru Gobind Singh Ji’s demise by Bhai Mani Singh between 1730 – 1732 CE after it is believed that he went to different places to collect Guru Sahib’s Bani (compositions). Sarbloh Granth is even more recent than that and all scholars agree it was not written by Guru Gobind Singh Ji but by a Granthi of Patna Sahib. Bhai Mani Singh is believed to have tried to assemble all the Guru’s works from many different sources and bind them into one volume, today known as “Dasam Granth”. However some scholars believe that Bhai Mani Singh may not have been able to assemble all of his works. “Dasam Granth” in earlier history has been used to refer to Saroop (volume) of Sri Guru Granth Sahib Ji that was dictated by the Tenth Guru and is parkaash in every Gurdwara around the world. The name “Dasam Granth” as well as “Damdami Bir” was coined to distinguish this from the “Kartarpuri Bir” of the same Granth (incomplete due 9th Guru’s bani not been included, as this was prepared by 5th Guru. It is also callled the “Aad Granth”). This “Damdami Bir” was prepared by Guru Gobind Singh Ji at Takhat Sri Damdama Sahib and bestowed Gurgaddi at Nander at Takhat Sri Hazoor Sahib in 1708. The “original” copy of this Granth is missing. The second Granth is “Dasam Paatshaah Da Granth”. This was originally called “Bachittar Naattak Granth”, and eventually acquired the name of “Dasam Granth” through history, mainly because the Guru Granth has been made Guru from 1708. Guru Gobind Singh Ji conferring Guruship to Sri Guru Granth Sahib Ji. Bhatt Narbadd Singh who was present at Nander when Guru Gobind Singh Ji gave Gurgaddi to Sri Guru Granth Sahib Ji mentions only the saroop of Sri Guru Granth Sahib Ji being parkaash. Some mischievous individuals argue that Sri Guru Granth Sahib Ji does not have bir ras or “shakti” power, and therefore both Granths (scriptures) or some in cases three granths (‘Aad Guru Darbaar’, ‘Dasam Guru Darbaar’ and ‘Sarbloh Guru Darbaar’) are considered Guru and should be parkaash together. It is argued that the British removed Sri Dasam Granth from the Gurdwaras to weaken the psyche of the Sikhs and weaken the Guru. This argument has been developed by Sanaatanist neo-Nihangs in the UK. There is no historic record of a ban on Dasam Bani by the British. In fact, Sikhs serving in the British army, in addition to Jaap Sahib and Svaiyay used to also read Chandi Di Vaar. Sri Guru Granth Sahib Ji is a ‘Poora’ Satguru (complete True Guru). A Sikh can read Sri Guru Granth Sahib Ji and get every type of power from it, be it Bir Ras or some other. It is blasphemous and insulting for someone to say Bir Ras can only be found from Dasam Bani. During the time of the Sixth Guru, Guru Hargobind Sahib Ji, several battles were fought with gallantry against the like of Mukhlis Khan and Abdulla Khan. The faith of the Sikhs in the sacred writings of the “Aad Granth Sahib” along with the their martial training, no doubt helped them succeed against the enemy. Indian sources: Sainapat (1711), Bhai Nand Lal, Bhai Prahlad, and Chaupa Singh, Koer Singh (1751), Kesar Singh Chhibber (1769-1779 CE), Mehama Prakash (1776), Munshi Sant Singh (on account of Bedi family of the Ulna, Unpublished records), Bhatt Valhi’s. Persian sources: Mirza Muhammad (1705-1719 CE), Sayad Muhammad Qasim (1722 CE), Hussain Lahauri (1731), Royal Court News of Mughals, Akhbarat-i-Darbar-i-Mualla (1708). Western sources: Father Wendel, Charles Wilkins, Crauford, James Browne, George Forester, and John Griffith. These sources clearly emphasize the tenants of Nanak as enshrined in Guru Granth Sahib as the only promulgated scripture of the Sikhs. Guruship being given to any other Granth other than Sri Guru Granth Sahib Ji or any other Granth being installed parallel to Sri Guru Granth Sahib by Guru Gobind Singh Ji is not recorded anywhere in history. Sri Dasam Granth installed on the same Takhat (throne) and parallel to Sri Guru Granth Sahib Ji. The photo shows an Akhand Paath of Sri Dasam Granth, although there is no historical reference to such a practice in any Sikh Maryada or institution. These practice are contrary to the Panth’s decision on the matter. This is a unique composition in a variety of metres, praising the characteristics and power of God. A wonderful drama, an intimate autobiography recounting the mission of the Guru. This poetic epistle in Persian was addressed to the Emperor Aurangzeb and throws light on the Guru’s opposition to tyranny and fanaticism. What impresses one in the Dasam Granth is the excellence of the poetic technique and the other choice of words and epithets. Guru Gobind Singh Ji – even when the situation appeared desperate, after his leaving Anandpur – never at all doubted victory or his unflinching faith in God. The versatility of this saint-soldier in composing devotional verses shows the richness of his mind, his spiritual attainment and heroic grandeur. WHY DID THE TENTH GURU NOT INCLUDE HIS BANI IN SRI GURU GRANTH SAHIB JI? This question comes to many people’s mind. The fact that this question is being asked leads us to conclude that it is a mystery put by the Guru. If Guru Gobind Singh Ji had wanted us to know why he had not included his own compositions and literature in Sri Guru Gobind Singh Ji and kept it separate then he would of have told us. However, the fact that the Guru did not reveal the reasons, means that we should just accept it and not ask questions. Some people argue that Guru Gobind Singh Ji did not include his own Bani in Sri Guru Granth Sahib Ji because he showed humility. However, the fact is that Guru Arjan Dev Ji included his own Bani in Sri Guru Granth Sahib Ji. So that argument does not stand. The Guru had full power and ability to include his own Bani in Sri Guru Granth Sahib Ji. The Guru included all of Guru Teg Bahadur Ji’s Bani in the volume of Sri Guru Granth Sahib prepared at Sri Damdama Sahib (known as the Damdami Bir). The fact that Guru Ji did not include his own Bani to Sri Guru Granth Sahib Ji is only known to the Guru alone. Guru Gobind Singh Ji ordered his Sikhs to accept Sri Guru Granth Sahib Ji as the sole Guru and that his Jyot (Light) would pass into Sri Guru Granth Sahib Ji and his body would be the Khalsa. Although the wondrous Guru did not include his Bani in Sri Guru Granth Sahib Ji, it was given eternal reverence and respect by having Jaap Sahib, Tve Prasaad Swaiyye and Benti Chaupai Sahib as part of the Amrit Sanchaar and Nitnem (daily prayers). Giani Gian Singh, a early 20th century Sikh scholar part of the Singh Sabha Movement, expressed in his book the Panth Prakash published in 1880 CE that the style expression in some of the works does not match that of the Guru. He writes, “The Granth that is now known as that of the 10th Guru. There was no Bir of this Granth during the time of the Guru. Banis remained separated here and there.” Sarup Daas Bhalla also expressed similar views in his book Mahima Prakash. There were 32 versions of Sri Dasam Granth circulating around Amritsar area by 1890, which included 6 printed versions. The number of compositions in each Bir varied also. 1. Historical Mani Singh bir has 15 compositions. 2. Historical Moti Bagh bir has 19 compositions. 3. Historical Sangrur bir has 19 compositions. 4. Historical Patna Sahib bir has 22 compositions. 1. Sansahar Sukhmana – It has 43 stanzas. 2. Vaar Malkauns – 11 pauris, Nanak Jo Prabh Bhawangey, Harji Harmandar Awangey. 4. Sri Bhagwat Gita Bhakha Sri Gobind Singh Kirt – translation and commentary of the Bhagavad Gita. It talks about the Khalsa warriors, the warriors in Krishnas army and other things. There is however doubt regarding the author. It starts with “Ik Oankaar Sri Waheguru ji ki fateh Patshahi 10” but the writing style seems more similar to one of the court poets than that of Akaal Ustat or Bachittar Naattak etc. Question arises as to why the Sodhak Committee deleted the following 8 compositions, and who authorized the committee members to do so. The original version of Sri Dasam Granth was not accepted by this Committee that suggests that the original version of this Granth has been altered and adulterated. The present-day published Sri Dasam Granth (1902) is the work of the Sodhak Committee. Further re-examinations and reviews took place in 1931, under the guidance of the Darbar Sahib Committee of the Shiromani Gurdwara Prabhandak Committee they too vindicated the earlier conclusion (agreeing that it was indeed the entire work of the Guru) and its findings have since been published. Sri Dasam Granth is not our Guru and cannot match the status of Sri Guru Granth Sahib Ji. But it is a scripture of the Sikh religion and the has been with us for many centuries. Hence it deserves respect. In recent years Sri Dasam Granth has been at the centre of controversy with Professor Darshan Singh, the former Jathedaar of Sri Akal Takht, questioning its authenticity and message. Unfortunately he not only criticised the Granth but has used much derogatory language for it. When summoned to the Sri Akal Takht Sahib, Prof Darshan Singh was very arrogant and stubborn and refused to engage in any discussions on the topic in private. As a result of this, on 5th December 2009, after giving many chances to discuss the issue within the frameworks of Gurmat traditions, an edict was issued by the Sri Akal Takht Sahib asking the Panth to boycott him and declared him as a ‘Thankhayia’ (liable to chastisement/punishment). 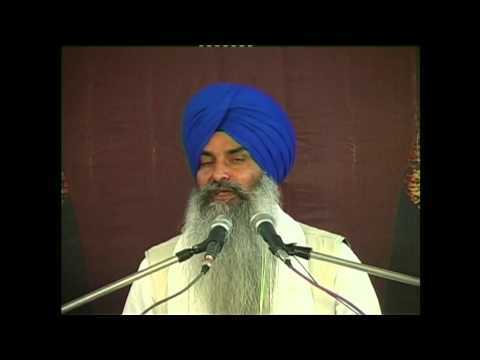 The Sri Akal Takht has asked the worldwide Sikh community to not engage in any debates on Sri Dasam Granth in public. If any individual(s) wishes to contribute to the discussion on Sri Dasam Granth’s authenticty etc then they should present themselves before Sri Akal Takht Sahib and respectfully engage in scholarly discussions rather than rake controversies amongst the normal Sangat. « Give the substance of the Japji.